Connect: Lectures begin with a “HOOK” that helps students connect their experiences and background knowledge to the lecture topic. Teachers set clear purposeful Learning Intentions and use modeled exemplars to guide student learning. Organize: Teachers present information in manageable “chunks”, which students record on visual organizers. Dual -Code: Teachers use a variety of techniques, such as visual/ physical aids, examples, demonstrations, vivid imagery, and processing activities to make content more memorable. Teachers close the lecture with a synthesis task that asks students to integrate or summarize what they have learned. The better students are able to connect new information to their own experiences, knowledge and sense of purpose, the easier it will be for them to create lasting memories. During lectures, teachers can use three techniques to link prior knowledge and capture students’ attention: the hook, kindling and the bridge. The Hook: is the bait teachers use to reel in students’ minds. Coming in the form of questions or activities that establish a strong sense of intrigue, wonderment and curiosity at the outset, it is designed to get students thinking about the content by tapping into their prior knowledge. Four kinds of hooks are used, each of which corresponds to a particular style of thinking. Mastery hooks: ask for recall and repetition of relevant information and have an element of challenge. Interpersonal hooks: engage students into the content by making a personal connection to the lecture topic. As students write down their ideas, sharing them with a partner, they are ‘kindling’ their own interest in the subject matter. The Bridge: Using the recorded students’ thoughts, a bridge is created to connect students’ prior knowledge to the new topic. More information is remembered more easily when it has a clear pattern or structure. When numerous bits of information is organized into catergories or chunks, the mind focuses only on a specific chunk of information- not all of the information at once- to find a particular piece of data. a structure of the chunks of information that students will be expected to collect during the lecture. Every visual organizer must provide enough space for students to fill in specific details related to particular chunks within the lecture. One key to using visual organizers effectively during a lecture is to slow students down. Instead of encouraging students to write as you present, let them listen. Then go back and record the critical information on the organizer using an overhead projector. Finally, let the students record the information on their organizers. Students need to be given the time and means to process the information they are required to remember. Can you see it? What image do you have in your mind? Can you feel it? Are there any sensations you associate with it? Can you smell it, taste it, or hear it? Are any other senses engaged? What emotions do you associate with it? Is there a story behind it? Strong memories tend to be very full of vivid images, strong sensory impressions, precise details and powerful emotions, often having a narrative component, making them richer and more meaningful than other memories. For greater learning, students need to be provided with opportunities to gather and process data through as many senses as possible, during lectures. vary the tone and level of emotion in their voices to emphasize the most important information. Teachers can use humor, stories, examples and elaboration to help students deepen their levels of engagement with the content. Rather than just simply recording information they have just learned, students need to be provided with ample opportunity to exercise and apply their new learning. Strong memories are created when they get to think about what they have learned The more students’ think, the more their minds begin to elaborate, thus cementing earlier connections. Interpersonal questions – to help examine personal values and feelings. By rotating through all four styles of questions, we ensure we are engaging all learners in the classroom. After the lecture, students apply what they have learned in a synthesis task that encourages them to process the content of the lecture as a whole. What: We all want our student to do well on tests and assessments. We want them to remember key information and transfer their knowledge into other parts of their lives. Why is it then, that so many of them seem to forget information so quickly? Well, one reason may be our reliance on passive review strategies. Think about how often we ask our students to do things like review vocabulary, read a page from a handout, or generically “study” their notes. The problem with these types of review strategies is that they are passive. They actually require very little cognitive processing. Even if you can get your kids to “review their work”, the entire process is fairly passive. A better approach is have students conduct self quiz. How: A self quiz can take many forms. Flash cards, partner quizzes, writing, and elaborating on one’s knowledge are all ways that a student can conduct a self quiz. One researcher described the process of a self-quiz as “self enlightening” – that is, the process of thinking about knowledge and status helps to uncover possibly faulty assumptions. Self quizzes require that students actually think about and process information rather than just reviewing or looking over their work. A self quiz – one in which they are required to think about, process, discuss, or explain their thinking requires the brain to retrieve and process the information. A review, on the other hand, only requires that students recognize key ideas. There is a world of cognitive difference between recognizing and retrieving. Evidence: Roediger & Karpicke (2006). Test Enhanced Learning: Taking Memory Tests Improves Long-term Memory. Psychological Science, 17, 249-255. Get everyone into a big circle. One volunteer goes to the middle. He turns to one of the participants in the circle and points to one part of his body, but says “ this is my ________and claims a different part of the body”. For example: pointing to his nose, says this is my foot. The participant in front of him, must answer the opposite. Example: pointing to his foot, says: this is my nose. The participant that fails to answer the opposite becomes the middle person. Variation: One person in the circle starts, turns to the person to his right, and keeps going. Those who fail to answer the opposite must move to the end of the circle. (next to the person who started). It is an excellent excersice to improve attention, concentration and fun which also busts dopamine to get students in a positive state. If you want to add content for discussion, I use it to adress the issue of being congruent between what you say and what you do. Actions should match speech. I´ve been using this strategy for quite a long time and made variations, and different applications. I cannot recall it´s source, sorry for that. I would love to hear how you implemented it and the results. Students are asked to reflect on a prompt. When they feel they have a thought, or are finished, they should put their thumb up as an indication that they are ready to move on. Pair-Share time is provided for students to share what they know. Thumbs-Up When Ready is useful for quick activities in which the wait-time between the beginning and the end of the processing might be as short as two to three minutes. Students are given laminated Processing Cards, or papers folded into “tents” that have “Still Thinking” highlighted in yellow (or a yellow circle /square), and “Ready to Share” highlighted in green (or a green circle /square) representing the two colors of a traffic light. Students place the card on the edge of their desk, with the side that says “Still Thinking” facing up or out. Students flip the card over so that the side that says “Ready to Share” is facing out or up as soon as they have completed their task. Teachers decide on an in-between activity that gives students who finish early an opportunity to apply or extend their learning. The Processing Card is useful for activities that take significantly longer, especially for when a final wrap-up activity depends on all students having completed a certain task. Deepen comprehension by thinking as they read and learn. Develop the capacity to reflect on and improve their performance as readers and learners through metacognition. Capture and put to use their own ideas, feelings, questions, and associations. The structure of Window Notes gives students a visual map revealing the complex relationship between the content and their own personal learning process. There are also two variations to the same window-like approach to note making: Math Notes for solving mathematical word problems and Four Thought for essay planning and developing layered interpretations. Introduce and model Window Notes by showing and thinking aloud to students on how you collect facts, questions, ideas, and feelings related to a particular topic or text. Students divide a blank sheet of paper into a window-shaped organizer of four quadrants. They label the quadrants Facts, Questions, Ideas, and Feelings. Introduce the text or topic to be learned. Students collect different kinds of notes and responses on their organizers as they read the text or learn about the topic. Students share their notes with the class, a discussion on what students have learned about the content and about their personal preferences as note-makers is conducted. Students use their notes to complete a set task. Over time, students are taught how to use the strategy independently, as a way to help them break new learning up into meaningful sets of information and as a way to help them pay attention to the inner workings of their own minds. The facts of the problem, including what is missing. The main question that needs answering, along with any hidden questions that lurk beneath the problem. A visualization that represents the problem in nonlinguistic terms. A set of action steps that can be used to solve the problem. An added benefit of Math Notes is that student’s build up a notebook of reference tools, where they can search for past problems and solutions that they can apply to new problems. Students firstly rule a section across at the top of the page, leaving a box to write in the actual word problem. The title being- The Problem. Below that, they divide the rest of the blank sheet of paper into a window-shaped organizer of four quadrants. Students should label the quadrants below –The Facts, The Steps, The Question, and The Diagram. Students share their notes with the class, and a discussion on what students have learned about the content and what note taking preferences they found most helpful. WHAT: The textbook is too often relied upon as the sole resource of instruction for the classroom teacher. While an essential resource in the classroom, the textbook can never take the place of a vibrant and engaging teacher. On those occasions when the textbook is used as a tool for instruction, understanding how to structure the information for text reading is critical. In Strategies that Work: Teaching Comprehension for Understanding and Engagement, Stephanie Harvey and Anne Goudvis provide strategies for active reading with textbooks. Be selective. Read smaller sections of text more carefully. Read selections in class so the teacher can guide. Pre-teach new vocabulary and unfamiliar concepts. Slow down the rate of reading. Use a variety of comprehension strategies to construct meaning, including activating background knowledge, questioning, determining importance, and synthesizing information. When teachers incorporate strategies for active reading, the text comes a vital part of the learning experience. EVIDENCE: Harvey, S. and Goudvis, A. (2007). Strategies that Work: Teaching Comprehension for Understanding and Engagement. Portland, Maine, Stenhouse Publishers. Merge thinking with the information by stopping, thinking, and reacting to the section. Code the text with sticky notes to hold thinking. Take notes on “think sheets”—two or three—column forms and graphic organizers to demonstrate thinking. Become familiar with and use the index to get information quickly. Turn and talk about the information. Read and respond to the textbook with a partner. Discuss sections of a chapter in small groups. Use the jigsaw strategy to read and share sections, reporting information. Take on different roles and perspectives and share with the group. How: While the initial study found results with Native American college students, might students of all ages and backgrounds also benefit from video captions? Give it a try – conduct some action research in your own setting. Turn on the video captions the next time your students watch an educational video. WHAT: Our eyes are capable of registering 36,000 visual messages per hour. Between 80 and 90 percent of all information that is absorbed by our brain is visual. We know that our visual system has both “what” (content) and “where” (location) pathways. Researchers believe this information is processed by the hippocampus in a visual fabric or weave of mental space. When we ask the question: “what did you have for lunch yesterday?”, most people ask themselves: “where was I?” In order to help retrieve the memory we possess a backup memory system based on locational cues because every life experience has to be, contextually embedded. We should take advantage of the visual power to process information. One important way we can use the visual environment is by providing changes in location and learning stations. HOW: Although different locations are the best way to provoke a maximum impact, we must learn to be flexible and make variations in order to make learning meaningful without limiting ourselves to the ideal, especially if it´s not possible. Use imagination to put children in different locations. You don´t necessarily have to move to a different location. Instruct the children to close their eyes. Imagine they are at…………. place. Imagine you are at the city of……….. in the year………..
What do you see? Whom do you see? How are they dressed? What are the predominant colors?, What do you smell? Open your eyes. Have them talk about it. Let them draw the scene they imagined. Then, go back to your teaching about the specific History lesson. This pattern can be applied to just any lesson. Teaching about places in the city like schools, hospitals, supermarkets. Teaching about geographic regions: rivers, mountains, valleys, etc. EVIDENCE: Jensen Eric. Brain Based Learning, Corwin Press, 2000. Eric Jensen is a former teacher with a real love of learning. He grew up in San Diego and attended public schools. While his academic background is in English and human development, he has a real love of educational neuroscience. For over 20 years, he has been connecting the research with practical classroom applications. Eric Jensen’s brain-based learning approach focuses on practical strategies linking brain research to student achievement. Brain-based learning is all about smarter, more purposeful teaching that can reach a greater number of students. It’s not any one single thing you do. It’s more about the on-going, purposeful aggregate of environment, instruction and curriculum strategies that makes it all work. 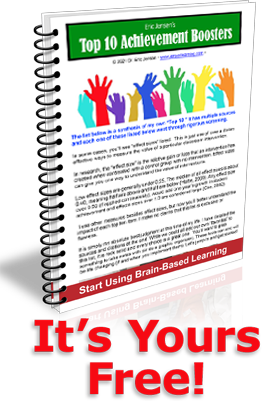 Jensen Learning integrates cutting-edge neuroscience with practical, user-friendly classroom strategies, to overcome challenging teaching environments such as poverty, AD/HD... helping you create a high performance school environment.